Do you just sit down and decide on the spot who you are sending emails to and try to come up with a brilliant message that will get opened, read, and returned? When you do this, do you find yourself wasting a lot of time staring at a blank screen as you try to figure out what to write and then in the end realize that the quality isn’t very good? If this describes you, I believe that my recruiting email workflow that I personally use and teach to my Busy Coach Clients will help. Over the next few weeks, I will break down each part and describe to you what it is. For those that are still wanting to get into the Win the Day Academy, you will also receive all of my templates, the actual emails that I use, and we will customize this strategy to fit you and your needs. Full Disclosure- About 8 years ago now, I had 22,451 emails in my inbox. The most telling symptoms of the need for a better personal productivity system are not age, organizational status, or income. The most salient sign your system is not serving you in the quality of your life. I knew that I was not as effective as I wanted to be, or as effective as everybody who was counting on me needed me to be because I wasn’t using my email the right way. For you coach, are you using email as the communication tool it was meant to be, or is it a constant distraction that pulls you away from other work that needs to get done? Coaches, let me remind you that we are not in the business of managing email. We are in the business of building great teams and people. Anything that distracts from that takes us away from our purpose. Through this email workflow I want to teach you, you’ll give email the time it needs and not second more. And that means you buy back productive time. The first part to this recruiting email workflow, which is an extremely important part to this, is doing research. I have found that the difference between good and great is an extra week of research. Instead of doing the same things the same way over and over again and expecting a different result, stop what you are doing and spend a week researching a better way. Ways for how to reach millennials. These 8 were things that I wrote down off the top of my head. But don’t you think your recruiting response rate or your day to day execution with email would be so much better if you could make improvements in each of these areas? My response to that is how much does your success mean to you? How frustrated are you with your email? Sorry if this is blunt but you really have 2 choices. You can take a week to research and stop the frustration and probably increase your success. Or you can continue to be frustrated, have email take up the majority of your day, and continue to get poor results. Your choice. 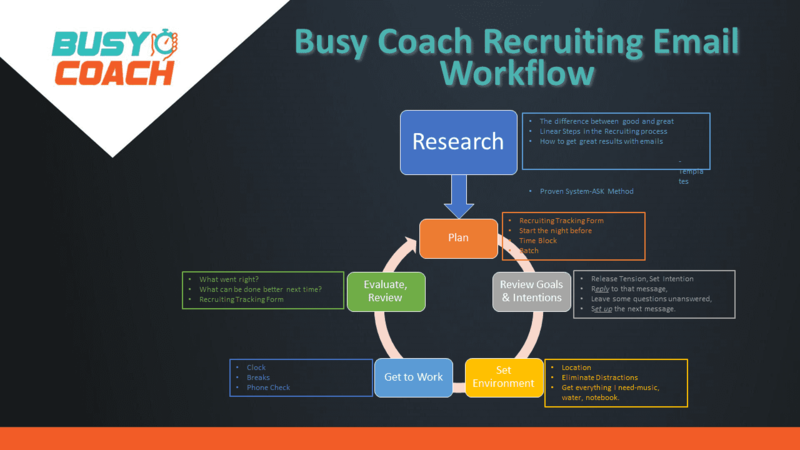 If you have any other questions before I share the rest of this recruiting email workflow, email me at mandy@busy.coach. You can get more of the details here at Win the Day Academy Group Coaching Program. Hope you have a productive rest of the week! P.S. – I’d love to hear your thoughts on this. Do you have a routine for doing email? Email me at mandy@busy.coach. If you want more tips about how to save time with recruiting, go to my website at www.busy.coach. P.P.S. If you have found this article helpful, please share it with your staff or other work colleagues! Studying time and energy management over these last 8 years and applying it to my coaching and recruiting has been a game changer for me. I am committed to helping coaches get more important work done in less time so more time can be spent with family and friends. Thanks!